I have been very conscious of the source and quality of the food that I prepare for Diane and I, especially over the last year, having switched to a Low-Carb way-of-eating. I find the health benefits of this approach far outweigh the cost of better quality foods and the breaking of old eating habits. I have become a fat-burning athlete that doesn’t need continuous high-carb supplements to perform. I’m not hungry all the time, and I get to eat all those great-tasting foods like eggs, bacon, sausage, steaks and green vegetables. It is a great transition from hunger cravings at 10 am, crashing in the afternoon and always wanting more to eating when I am hungry, controlling my weight without extreme effort, and better overall attitude and motivation. be dictated by your energy demands, body weight and composition goals, and satiety. needs to be maintained at a level that matches your energy expenditure, thus holding your body weight stable. Think about it – if about 20% of your daily energy comes from protein and 5% from carbs, where’s the other 75% of your energy going to come from? The answer, of course, is ‘fat’. ( AND ) Yes, when you are losing weight (i.e., shrinking body fat stores), some of what you burn does not need to be supplied by your diet. the diet recommended by Herbalife is not only unhealthy, but also promotes disease. I mean really, I can’t even count the ingredients in the junk above. Among them are hydrogenated soy, canola and cottonseed oils, margarine, autolyzed yeast extract (also known as MSG), artificial flavors, wheat protein and corn syrup. The term natural flavor or natural flavoring means the essential oil, oleoresin, essence or extractive, protein hydrolysate, distillate, or any product of roasting, heating or enzymolysis, which contains the flavoring constituents derived from a spice, fruit or fruit juice, vegetable or vegetable juice, edible yeast, herb, bark, bud, root, leaf or similar plant material, meat, seafood, poultry, eggs, dairy products, or fermentation products thereof, whose significant function in food is flavoring rather than nutritional. Natural flavors include the natural essence or extractives obtained from plants listed in 182.10, 182.20, 182.40, and 182.50 and part 184 of this chapter, and the substances listed in 172.510 of this chapter. This means that MSG, GMOs and a ton of other sketchy ingredients can be listed as “natural and artificial” flavors. After reading these reviews, I think you’ll choose better. But what is better? I find for a simple high-protein snack a hard-boiled egg does nicely — easy to bring with you, keeps well and is individually wrapped. Has 6g of protein, 5g of fat and very low carb (.6g) per large egg. Hammer Nutrition’s Whey powder is also good and free of bad ingredients. There are other whey powders both flavored and unflavored that are good. Look at the ingredients list. 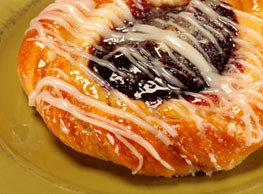 Nutrition Facts: Makes 2 ~1/2 cup servings, per serving: 192 calories, 8.7g Fat, 21.1g Protein, 7g Carb. I will often make a protein coffee in the morning — 8oz coffee, 1 TBS MCT Oil, 1 Scoop of Hammer Whey, 2 TBS Great Lakes Beef Gelating and a TBS of heavy whipping cream. Mix it all together and you have 244 calories, 20.5g fat, 1.0g Carbs, and 23g protein. Kind of like a tasty and healthy latte with a kick (but no sugar)! Satisfying and easy to do when you want something quickly. Where did My Muscles Go? The general public consensus is that we lose muscle mass (size and strength, too) as we age. But there are notable exceptions to the rule — athletes who have performed exceptionally well into their 70’s and even 80’s. See the World master’s rankings. For example, in the 2012 10K rankings list there are 38 runners age 60 to 85 that ran the 10K in less than 40 minutes, including the US runner, Nolan Shaheed (35:26 10K, 60-65 age group) who has age group records at several distances. Well known triathlete coach Joe Friel just posted in his blog an article about maintaining muscle mass and the notion that we are destined to lose muscle. He reviews the latest studies that actually show little or no muscle mass loss is due to aging. What, you say? There are athletes that maintain muscle mass well into their 70’s, the key is that they work at it. See the photo from coach Joe Friel’s blog at the right. The middle muscle scan photo is a stark reminder that we are too sedentary in our lives. From sitting at our desks for 8-10 hours all day then watching TV for 3-4 hours at night. How many of us do 1-2 hours of strenuous activity each day, or even 30 minutes as recommended? Less than 3% of the US population according to some studies I have seen. There’s a second aging/sedentary lifestyle issue here, not only does a sedentary lifestyle cause you to lose muscle mass, it also causes the loss of nerve control of the muscles. Older, sedentary people have less nerve connections to their muscles, thus can’t recruit the muscles they have. Just another brick in the wall of information that says that we must keep moving, keep exercising, keep the intensity up, and just don’t sit around. Guess I’ve been right to keep that big commercial walk-behind mower for the last 20 years. I’ve always joked that it was my exercise program — 2-3 hours a week of walking at 3 MPH in tight circles. We all know that the soreness we feel is due to the tiny muscle tears that occur when we stress muscles to build muscle strength. Some light exercise a day or two after an intense one will increase your blood flow, promote healing and enable the muscles to move more easily. Take a Walk – a 20 minute stroll at moderate pace around the neighborhood or on a treadmill. Hit the Pool – Swimming a few easy laps will warm up the body and boost circulation. And best of all – it’s super low impact so won’t jar your joints. Work Out Your Core – Balance, or core focused moves, like single leg squats or side planks improve blood flow, up overall fitness and still give whining muscles a break. And when all else fails, I hear a day at the spa is a scientifically proven cure-all! 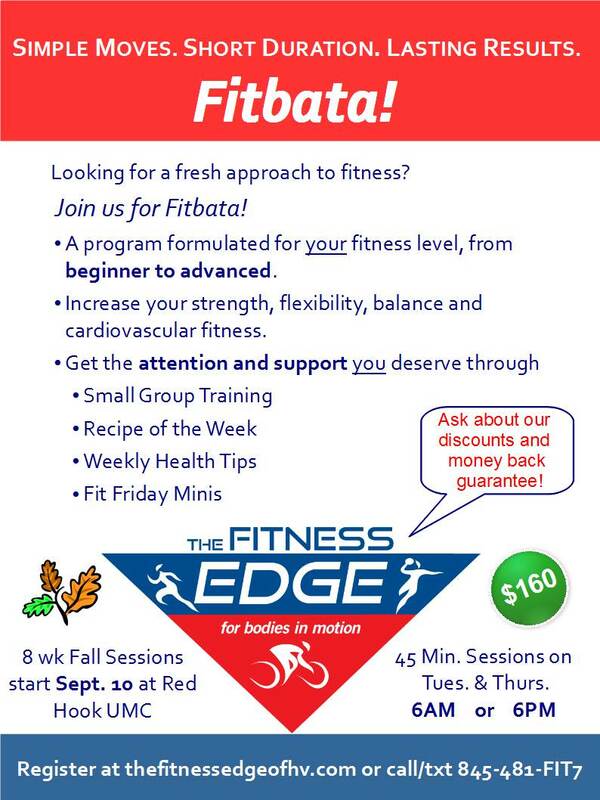 Announcing *NEW* Fall class- Fitbata! …9 and 10 complete the weight loss list! Have you ever noticed that when we write things down they somehow become more real? The transcription of a thought or idea to paper can transform a mere intention to a commitment. The written word is enduring. We can come back to it and stare at it. It can be a constant reminder. This is exactly what I found when I started my 2 week food log. Recording every little thing I ate or drank, everyday achieved two things. First, it laid out my intake in black and white – there was no escaping the reality of my diet “quality and quantity”. Secondly, it made me think twice ( Ask Why?) about eating something because I knew I had to record it. I could look at the record for a day, see that I had made good choices for breakfast and lunch. Did I really want my next entry to be “Snickers bar”? (What if someone walked by and read my log? Yikes!) Tip #9 – Monitor Intake, is a highly effective and proven strategy for helping you maintain the healthy lifestyle and eating habits you’ve adopted. Yes, it can be tedious, so focus on the benefit – and no excuses! If you’re not the pencil & paper type, you can always download your favorite food log app ensuring quick and easy logging wherever you and your SmartPhone go. Completing our list, coming in at the tenth spot, is Be Real. Start Now. It’s great that you’ve decided to abandon you current routine of skipping breakfast, super-sizing your fast food lunch and chugging a litre soda at dinner. But don’t think you can just flip a switch and replace those meals with some green puree from the blender! BE REAL! Everybody could do something like that for a week, perhaps a month, which can easily result in weight loss. But the question is, can you sustain that change? You don’t just want to lose weight, you want to make permanent lifestyle changes that will carry you well into the future. A plan that constantly denies you of certain foods typically results in a plan you can’t adhere to! Don’t be a saboteur! And Start Now. No time like the present. Don’t wait until after the wedding feast. Don’t start after you get back from vacation, or once Thanksgiving is over. Start now, with realistic changes and you’ll find managing your diet and exercise throughout the calendar year will be surprisingly doable! Did you miss the other tips in this weight loss series? Jump to them now using the links, and let us know what tips you would add to the list! Find tip #8-Be Optimistic! and #7-Know Thy Friend in Lose weight with Tips 7 & 8, #6-Turn Off the TV and #5-Ask Why? in Tips 5 and 6 on the weight loss list, and tip #4-Eat Breakfast! #3-Check the Scale, #2-Portion Control, and #1-Exercise, in Weight Loss Tips – can you name all 10? Lose weight with tips 7 and 8! Remember when you were a kid, and your mother gave you a hard time about one of your friends? “I don’t want you hanging out with him. He’s a bad influence!” she’d say. Or what about all those “dull programs” your dad wanted you to be part of because the “smart, good kids” belong to those. We’d be annoyed because “our friend wasn’t like that”, and our parents were simply judging the book by its cover. On the other hand, the parental view was simply about promoting positive social associations, to best of their ability. And this brings us to weight loss Tip #7 – Know Thy Friend. 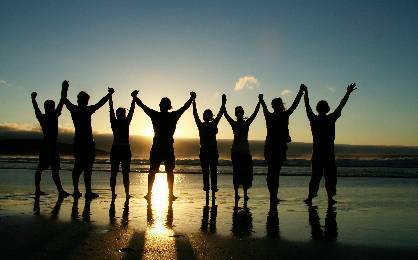 In a 2007 report on a study conducted by Cristakis and Fowler which followed 12,000 people over a 30 year period, they concluded that obesity spreads through social ties. That is, overweight people tend to have overweight friends. The report attributes this to the person’s perception of the acceptability of obesity. So the thought process works like this – “if my best friend is obese and my sister is overweight, but I love each of them… maybe it’s not so bad if I gain weight or if I’m obese too.” If your overweight friends are inactive, eat out a lot or eat too much, then it is more likely you’ll do the same. At least when you are with them. So what can you do? Stick by your friends, but encourage some new behaviors. Invite your friend to join a gym with you. Become workout buddies. Introduce more walking or biking when you get together. 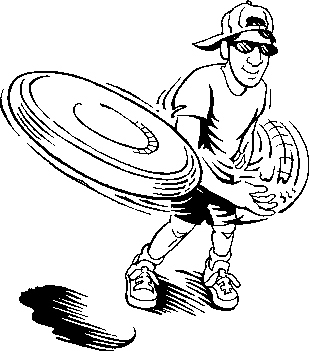 Walk to the movie theater or bike to a park for some Ultimate Frisbee! Whether you’re talking about adding more activity into your daily routine or modifying your diet – Change is hard. Tip #8 – Be Optimistic! reminds us that maintaining a positive, can-do, attitude will make you successful. Set smaller, realistic goals for yourself so you can easily see your progress and feel the success. When you maintain control and a fighting spirit, eliminating negative behaviors and losing weight will be your new reality! Only two more tips to go. Don’t jeopardize the healthy, active life you want to live! Be sure to review tip #6-Turn Off the TV and #5-Ask Why? in Tips 5 and 6 on the weight loss list, and tip #4-Eat Breakfast! #3-Check the Scale, #2-Portion Control, and #1-Exercise, in Weight Loss Tips – can you name all 10? Until next Friday, … keep your body in motion!